A rug’s worst enemy is grit! The abrasive nature of embedded grit causes pile fibers to break down, diminishing the beauty and shortening your rug’s life. Weekly vacuuming lifts superficial dirt out of your rug. However, periodic professional cleaning is essential to remove deep down dirt and grit. How do you determine if a rug needs professional cleaning? If the dirt is visible to your eye or if it has been years since the last cleaning! IMPORTANT ADVICE - Never allow anyone to clean your Oriental Rug or Area Rugs in your home ! 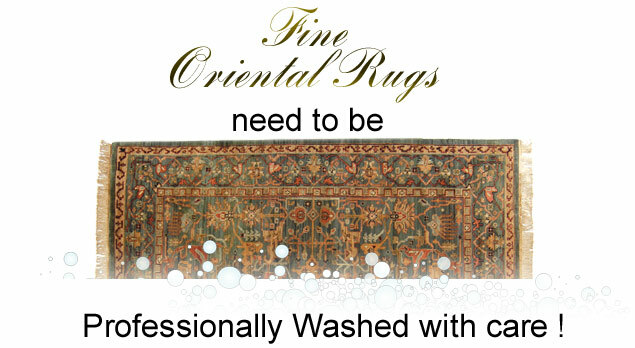 The ultimate cleaning process for fine Oriental rugs and carpets! First, your carpet is carefully vacuumed, front and back to release primary grit. Then, your rug is immersed in water containing our exclusive formulas and processed in our specially designed washing equipment. The water and cleaning solutions penetrate freely to the deepest layer of the rug’s nap, removing ground-in dirt without crushing the wool. In most cases, this restores the rug’s original look and texture. After the wash, your rug dries in a climate - controlled room where temperature and humidity are carefully monitored for optimum drying conditions. This professional drying process is one of the most critical steps in rug conservation and an essential reason for sending your rug to our professional rug cleaning plant! Dilmaghani - We serve the wholesale, design and retail trades throughout New York, New Jersey, and Connecticut. NY - Serving Putnam, Rockland, Westchester County, & New York City (Manhattan, Bronx, Queens, Brooklyn, Staten Island, & Long Island). CT - Serving Fairfield, New Haven, & Hartford Counties. NJ- Serving Bergen, Hudson, Sussex, Passaic, Essex, Union, & Morris counties.